Liverpool legend and former Manchester City forward Robbie Fowler believes we could be seeing the greatest team in English football history in the form of Pep Guardiola’s Manchester City. 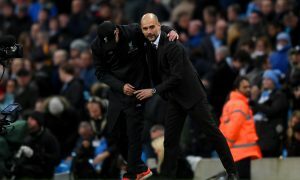 The Blues returned to the top of the Premier League with an outstanding 6-0 win over Chelsea on Sunday at the Etihad Stadium, although Liverpool have a game in hand. And Fowler, who played for both clubs, believes in terms of squad depth and quality, City may be better than Arsenal’s legendary Invincibles side and Manchester United’s treble-winning team of 1999. “This­ Manchester City squad is quite possibly the best I’ve ever seen in English football in terms of depth of quality,” Fowler wrote in his article for the Mirror. Despite their excellence, City are having to fight Liverpool and Tottenham, who are keeping up with the top two, in what is turning out to be an exciting title race. Fowler said: “City won the title at a canter last season, because no other team was anywhere near good enough to be spoken of in the same breath. Will A War Of Attrition Decide Premier League Title? Man City ranked in top 10 biggest clubs in the world – how do they compare to rivals?